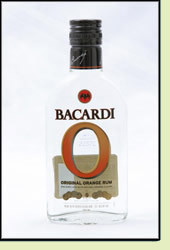 Andy: Bacardi O tastes a lot like an orange cough drop by itself. As with most Bacardi products, I do not recommend drinking straight. Mixed with pineapple juice, the rum retains it’s orange flavors but makes the pineapple taste a little dry. This might be a good rum mixed with others, but less is better. Adrian: It has a nice Orange smell but doesn’t go down too smooth by itself. It tastes OK mixed with pineapple juice, but the two flavors may not be the best together. I’d opt for the Bacardi Limon instead. This would be a good adder to orange juice based drinks for sure.